In a large bowl, whisk the flour with the baking powder, baking soda and salt. In the bowl of a stand mixer fitted with the paddle, beat the butter with the granulated sugar and brown sugar at medium speed until fluffy, about 2 minutes. Beat in the eggs and vanilla until incorporated, about 2 minutes. At low speed, beat in the dry ingredients until the dough just comes together. Beat in the oats, pretzels, coconut, chocolate chips and ginger. Scrape down the side of the bowl and cover it with plastic. Refrigerate the dough for 1 hour. Preheat the oven to 350°. Line 2 large rimmed baking sheets with parchment paper. Scoop heaping 1/4 cup mounds of the dough onto the prepared baking sheets, leaving about 3 inches between each cookie. Stud the top of the cookies with additional chopped pretzels, chocolate chips and ginger. Bake the cookies for about 15 minutes, until the edges are lightly browned. Transfer the baking sheets to racks to cool before serving. 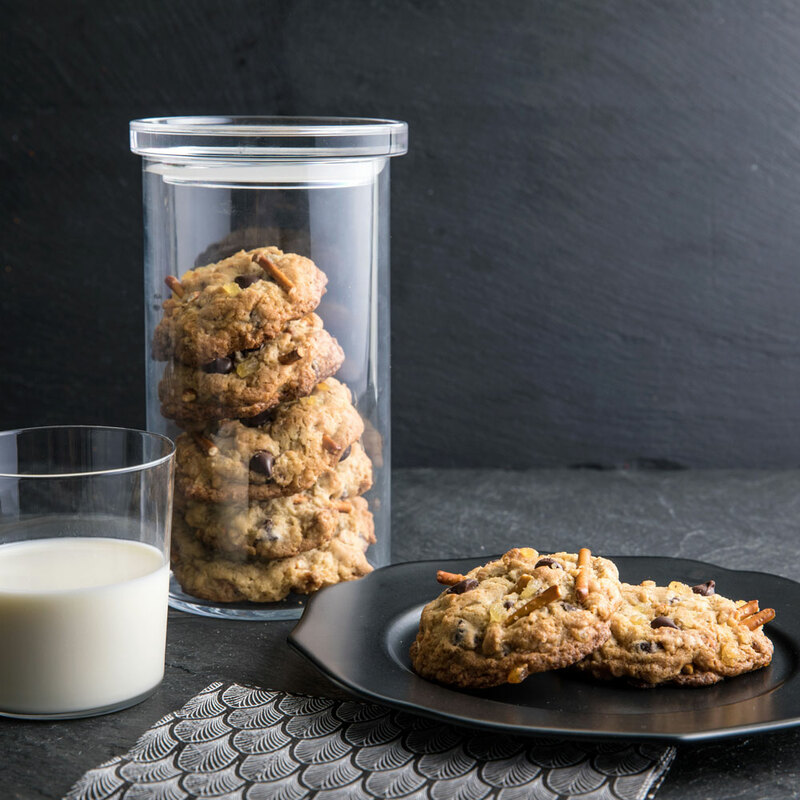 The cookies can be stored in an airtight container for up to 5 days. Review Body: This monster sugar cookies look amazing! Review Body: Love the name of this recipe, Monster Sugar Cookies!! !